All transactions are safe and secure with a reliable history in online purchasing behind each of our associates. 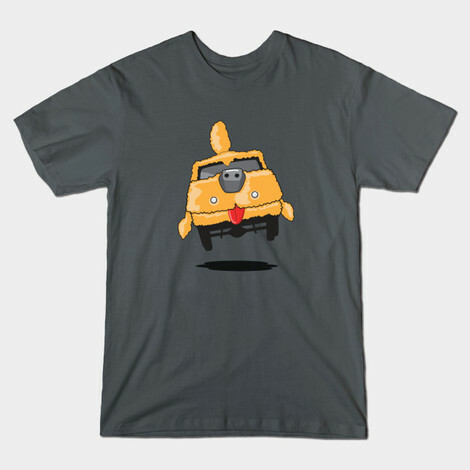 Buy the Shaggin' Wagon t-shirt to own Dumb and Dumber clothing and merchandise. What is the best way to spend your life savings? Harry believed that spending the money to transform his van into a sheepdog on wheels for Mutt Cutts was the best idea ever...until he got fired that is. Either way, we are glad he did it or we wouldn't have the privilege of seeing something as hysterical as this Shaggin' Wagon t-shirt. If you agree, then snag this Dumb and Dumber shirt to spread around the laughter and smiles you experienced when you first saw it. Support the store that inspired Harry Dunne's awesome automotive renovation by checking out the Mutt Cutts t-shirt below. In addition to the Shaggin' Wagon tee above, browse the Dumb and Dumber Clothing Gallery for more apparel like men's and women's clothes, kids shirts or hoodies.